Gossip spices up our daily routined life and makes it more entertaining. Girls are well known for their gossip and fashion spirit. Girls like to gossip as much as they like going shopping or watching a movie, don’t you, girls! When bffs get together during school breaks, after school or in weekends, they gossip about boys, fashion, girl rivals and latest news. Get a sophisticated gossip girls makeover and give girls and boys something to gossip about! 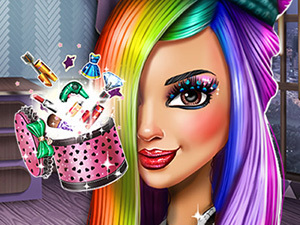 Gossip Girls Makeover facial beauty game is about style, sophistication, glamour, femininity and high life elegance. Gossip with your girls about the latest beauty treatments for getting a smooth and silky skin complexion: face cleanser, face scrubs, face masks and face creams. Learn how to get fancy fashionista eyebrows, shaping them up according to the latest trends. Get a sophisticated and glam make up with glowing make up colors and professional high style make up tools. Make all girls gossip about your fancy chic designer dresses, trendy hairstyles and dazzling designer earrings made of precious gems, silver and gold. Enjoy Gossip Girls Makeover facial beauty game and get a sophisticated Hollywood celebrity look worthy of all the fashion gossip!